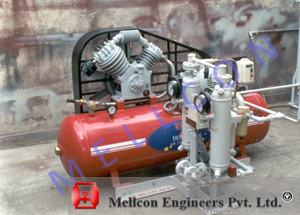 Air Compressor compresses the atmospheric air thereby raising its temperature & humidity. This hot air is cooled in Water Cooled After Cooler to a temperature of 400 C and in the process moisture condenses & drained out. This air is stored in air receiver and then passes through the Air Dryer where air is dried to a a desired Dew Point. This fully dry air is sent for the pneumatic/process application . For cost comparison of operating of a Heat of Compression Type Air Dryers Vs. Heated Type/Heatless/Refrigerated Type Air Dryers please click here.